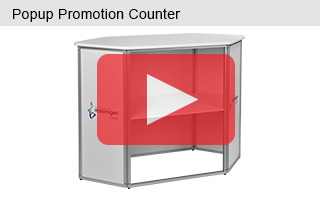 Promotional displays assemble in 1 minute without tools needed! These promotional displays have solid aluminium construction that is great for use in a number of different locations. Exhibitions, supermarkets, trade shows, and store events will all be able to use these counters in an effective manner. The portable counters, promotional displays have white laminate panels that can be brought to a local sign shop to have custom graphics printed on. The display can also be used as is, without any printing needed! The promotional displays are quick to set-up, requiring no tools and taking only around 1 minute for full assembly. 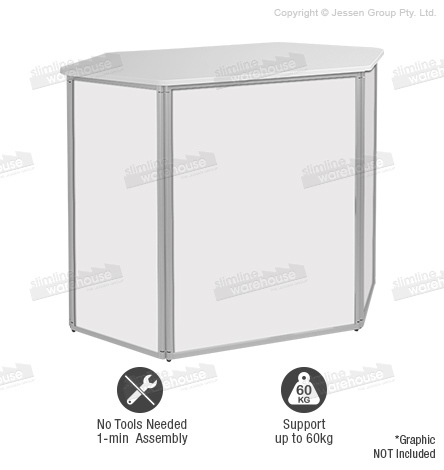 Counter displays, portable popup tables, and other promotional displays can support up to 60kg. The counters also have an inner shelf that is ideal for holding employee beverages, additional stock or informational materials. The promotional counters also include a carrying bag for transport. The entire display weighs under 20 kg! The promotional displays provide your business with a quality popup table that will last for many years to come. A portable counter is quick to assemble and great for a number of different locations. The sturdy construction ensures years of use. For additional products to outfit your business, please browse through our online catalogue. This and many of our other products are available with same day shipping when in stock & ordered by 1 pm, only from Slimline Warehouse.